Local breweries are popping up across our state — from Havre to Hamilton, from Libby to Lavina, from Sidney to Sheridan. These breweries are offering a high-quality, made-in-Montana product. They’re providing a comfortable space to relax after work or to mingle with our neighbors. And they’re bringing money into our towns, revenue into our state, and jobs into our communities. So what do we mean by a craft brewery? According to the industry’s national trade association, an American craft brewer is small, independent, and traditional. 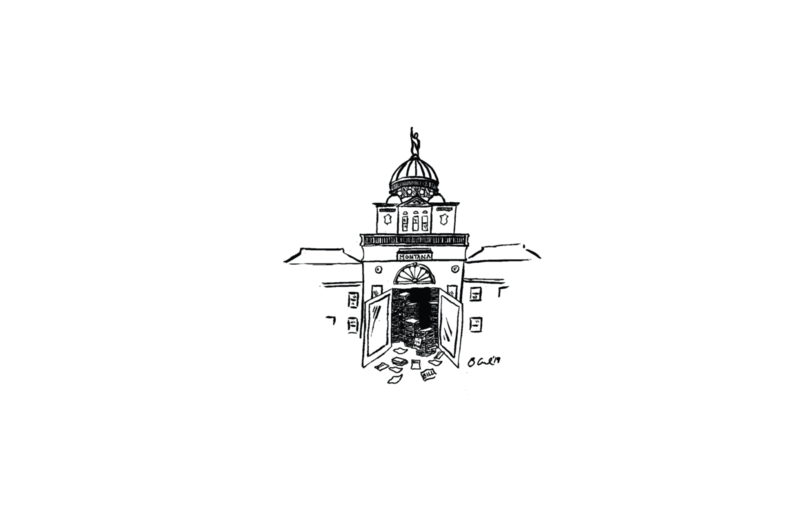 Its annual production must be equal to or less than 6 million barrels a year — although under Montana law, craft breweries lose some distribution rights over 60,000 barrels per year. It’s owned and controlled, for the most part, by craft brewers. And the majority of the brewery’s production must come from from its own creative recipes. So we’re not talking about the 12-pack of Olympia that you can buy at your IGA. We’re also not talking about the Mint Bar down on the corner. 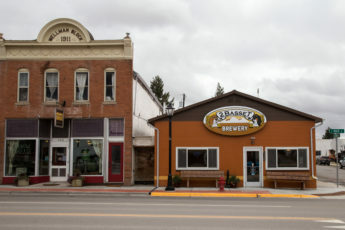 In Montana, the craft beer industry is growing. The number of breweries in our state has more than doubled since 2011. Cheers to all the growers, malters, manufacturers, brewers, and servers who have made that growth possible. We raise our glass to you! Data comes from the Brewers Association website. Overall production has increased 87 percent since 2010. Sales have increased 111 percent from 2010 to 2015. Employment has increased 204 percent from 2010 to 2015. These most recent stats show huge increases in production, sales, and employment. But what’s brewing underneath all those numbers and figures is the real kicker. As Montana’s craft beer industry grows, its success pours over and benefits all of us. The success of Montana’s craft breweries has a wide ripple effect. What are those economic benefits? According to the findings, craft breweries provide an additional 1,044 permanent, year-round jobs in the Montana economy. These jobs and this industry bring in more than $33 million of personal income into Montana households. And collectively, the industry is paying taxes on $36 million of revenue each year. Considering the trajectory of this industry, these numbers are probably higher now than they were in 2016. The Brewers Association has its own study on Montana craft breweries. It looks beyond the direct impacts and consider the larger effects that breweries have. According to Sarah Billiu, the group’s membership coordinator, 2,995 Montana jobs are directly or indirectly created by craft breweries. The Brewers Association also says that Montana’s craft breweries have a $417 million economic impact on our state. That includes everything from a barley farmer’s profit to the money spent by a brewery worker at a local restaurant and everything in between. There are a lot of stats and numbers being tossed around here. 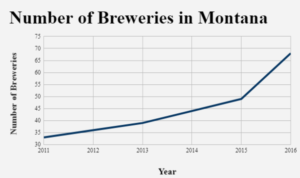 But what really matters is what these numbers get at: Montana craft breweries aren’t just about beer sales. Their effect spreads out into other key Montana industries. We’ll be talking more about this in our second installment, but here’s a little taster. For agriculture, small breweries give our farmers another outlet for their products. Whether we’re talking about honey, hops, barley, or wheat — craft breweries help spur competition and provide stability for our producers. And as we’ve talked about before at Prairie Populist, when agriculture does well, we all do well. Photo from the Montana Wheat and Barley Committee website. Thanks to our craft breweries, Montana is raising the bar. Right now, there are over 5,000 retailers selling Montana-made beer in 24 states. 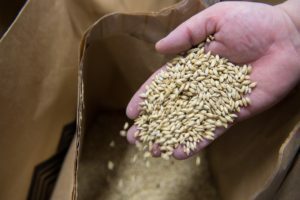 Our state is the second-largest barley producer in the county, and much of that barley is grown here, malted here, brewed here, and consumed here. And Montana’s craft breweries have become a driving force behind our ever-growing tourist industry. So how do we compare to other states? Montana is second in the number of breweries per capita. There are nine breweries for every 100,000 adults over 21. Breweries’ per-capita economic impact in Montana is the fifth-highest in the nation. Montana is 8th in the number of gallons produced per capita at 7.3 gallons per adult over 21. Thanks to a new law that increases production limits, this number will certainly go up. 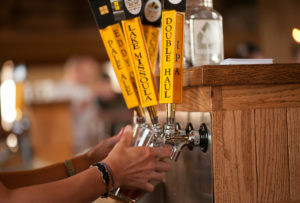 Montana’s craft brewing industry has elevated itself to the top at an impressive rate. As our Montana laws become more supportive of craft breweries and as more breweries pop up around the state, its effects will continue to spread. Check back for Part 2 in this series, where we’ll tap into the reasons why this industry makes so much sense for Montana. In the meantime, bottoms up and cheers to you.